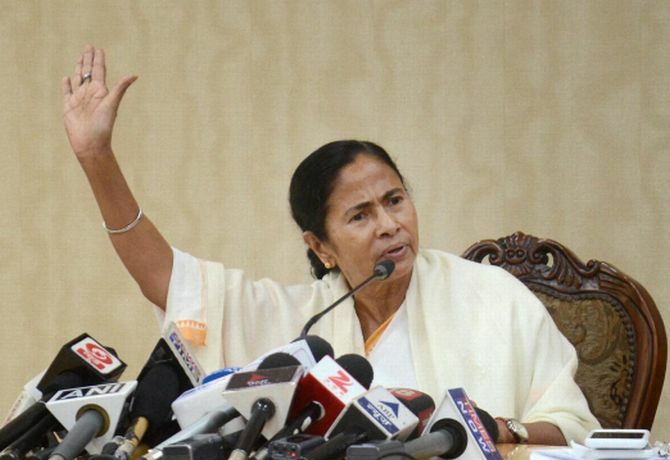 The unprecedented public spat between West Bengal Governor K N Tripathi and Chief Minister Mamata Banerjee escalated on Wednesday with the former alleging her charges are meant only to emotionally blackmail the people of the state even as the Centre stepped in to defuse the row. Union Home Minister Rajnath Singh spoke to Tripathi and Banerjee separately and is understood to have told them to resolve their differences amicably. The spat over the communal flare-up following an objectionable Facebook post in North 24-Paraganas district also led the Congress to demand the recall of Tripathi, accusing him of compromising on constitutional propriety. Singh is said to have counselled Tripathi, a former BJP veteran and ex-speaker of Uttar Pradesh assembly, and Banerjee to resolve their differences amicably, official sources in New Delhi said. In a second statement in two days released by the Raj Bhawan, Tripathi dismissed as baseless Banerjee’s allegations that he “humiliated and threatened” her over phone while inquiring about the situation in the violence-hit Baduria in North 24-Paraganas district. The statement also said that the governor is fully aware of his constitutional obligations and limitations and needs no lesson from anyone on this count. “Instead of making accusations against him, it is better for the chief minister and her colleagues to direct their attention to maintain peace and law and order in the state without making any distinction on the basis of caste, creed or community. “The governor is of the view that Raj Bhawan is not a department of the state government and is open to every citizen to approach him for redressal of his or her grievances,” the statement said. Reacting sharply to TMC secretary-general Partha Chatterjee’s statement that the governor is crossing his constitutional limits, Tripathi said it is an attempt to cover the lapses of the state government and divert attention from the main issue. “The governor has been apprised of the statement of Partha Chatterjee, Hon’ble education minister, and regrets to say that this is an attempt to cover the lapses of the state government and divert attention from the main issue of law and order,” the statement said. Criticising Banerjee for raising questions on how being a governor, he interfered in the law and order of the state, Tripathi said, “True that the chief minister has been democratically elected by the people, but it should not be forgotten that the governor is also appointed by the president on the recommendation of a democratically elected Union government.